Staff from StPatsTech recently took a trip to Hawaii. That is to say, they virtually went to the Pacific islands thanks to an immersive experience at Saab Australia’s headquarters at Technology Park. Saab Australia is one of the College’s P-TECH partners along with Century Engineering and PMB Defence. The three leading defence industry companies recently hosted teachers and staff for a professional development session to help the educators better understand the businesses and their specific work projects. 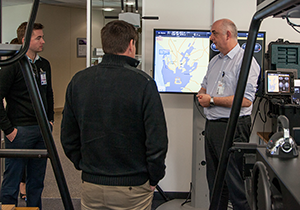 From managing a battlefield, thanks to Microsoft’s HoloLens, to seeing inside the security system for a prison and learning how the Royal Australian Navy is able to combat missile and torpedo attacks, the College staff were able to get a picture of Saab Australia’s multifaceted business. The group also heard from Kerryn Smith, Director of Industry at the Defence Teaming Centre, who spoke about the current and future employment opportunities in South Australia’s defence industries. Ms Smith said with the number of large defence contracts now in place, programs like P-TECH were integral in ensuring a consistent and well-trained local workforce. This workforce would ensure the on-going success and strength of defence industries in South Australia, Ms Smith said. The group were hosted during the site visits by Saab Australia Managing Director, Dean Rosenfield, Century Engineering Managing Director, David Heaslip and PMB Defence’s Engineering and Program Manager, Claude Messina. Earlier this year, StPatsTech announced its partnership with the three companies. The College has already started delivery of the industry led P-TECH Engineering program (with Century Engineering) and Electrotechnology program (with PMB Defence). The Saab Australia P-TECH partnership will see the introduction of a new Information Technology program for the College in 2018 featuring a Certificate IV in Programming. This industry-level certification will see students concurrently study the IT qualification alongside a fully contextualised SACE course over two years. In addition, the students will receive unique mentoring, work experience and access to projects with Saab Australia. Typically, Saab Australia recruits its next generation workforce as engineer graduates from software, mechatronic and electronic disciplines, but the world is changing. Fast. Saab Australia’s People Development Manager, Rebecca Giovine says, “We know we need to engage with and inspire students early to show them the exciting, rewarding careers our industry offers. Our collaboration with StPatsTech through the P-TECH program certainly helps with that objective”. College Principal, Rob Thomas, said the Certificate IV in Programming presents a great opportunity for students to gain valuable skills, industry mentoring and connections and real-world experiences. “These P-TECH courses could lead to an amazingly diverse and interesting long-term career across a range of industries,’’ Mr Thomas said. Enrolments for all StPatsTech programs in 2018 are now open. 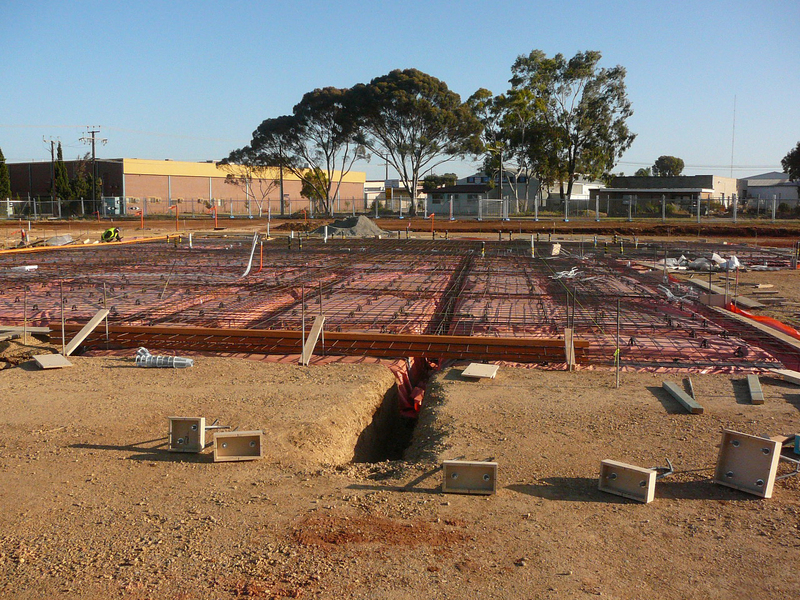 Visit www.stpatstech.sa.edu.au for more information. This entry was posted in Industry Office, Latest News on 26/07/2017 by St Patrick's Technical College. For architect, Peter Moeck, designing a successful building is more about the outcomes for the people inhabiting that space than awards and praise. 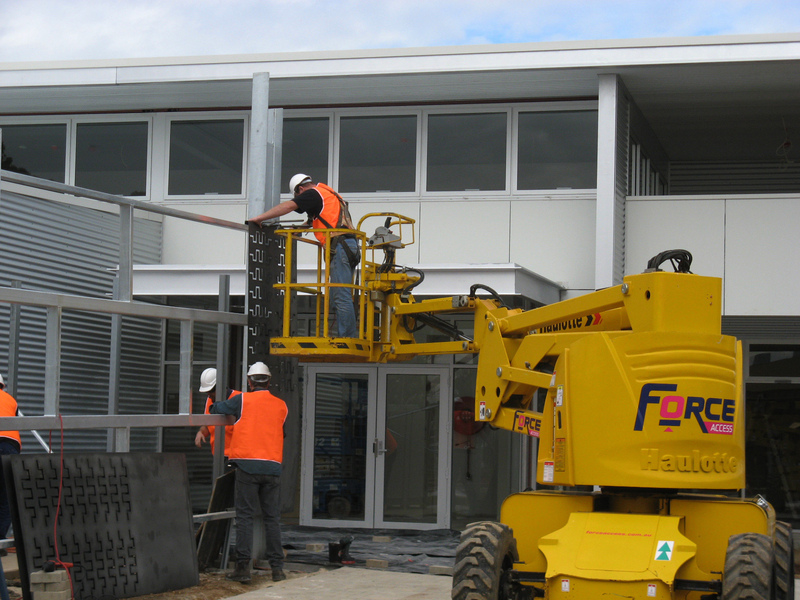 Peter, who has been St Patrick’s Technical College’s architect since before a site for the school was even selected, recently returned to the college to oversee its new $120,000, 150-square-metre extension. 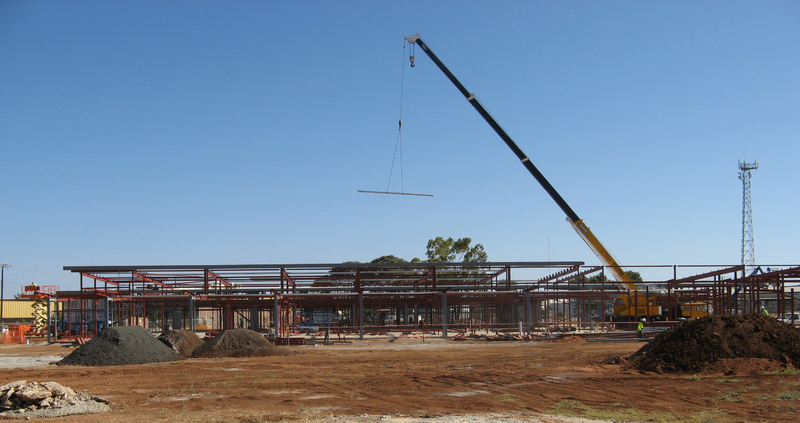 The expansion will provide more space for the School of Building & Construction, in particular for wet trade specialities. 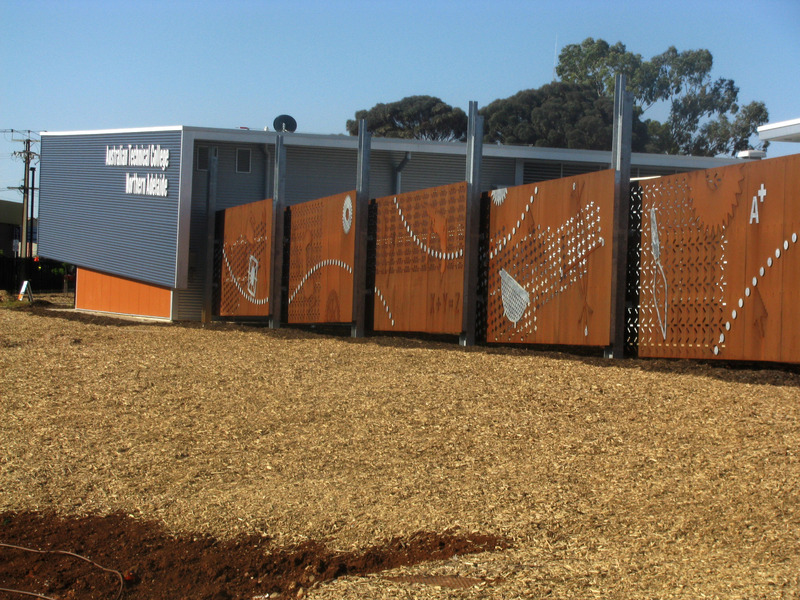 A specialist in educational architecture, Peter said when StPatsTech (then known as the Australian Technical College – Northern Adelaide) was being designed, modular systems were hugely popular for schools. However, not a fan of the modular model, Peter said he was happy when the project partners agreed StPatsTech should be a purpose-built facility. “You have got to purpose-build because the results are enduring and robust,’’ he said. Peter said the brief for the design was to produce a campus that was sympathetic to its industrial surroundings but to be contemporary and comfortable, have the maximum floor space, be highly functional and be cost effective. 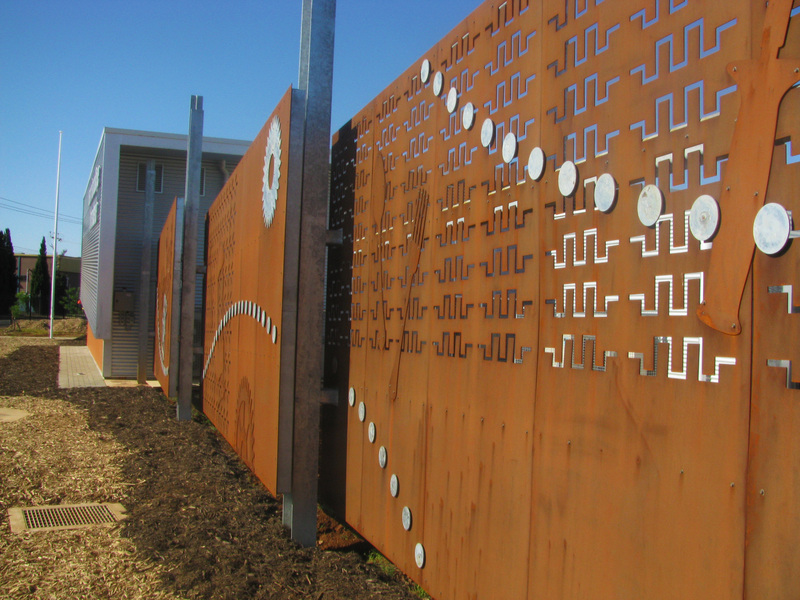 He said his favourite part of the campus is the large 64 metre long, three metre high rusted steel screen which runs the length of the Hooke Road side of the campus. 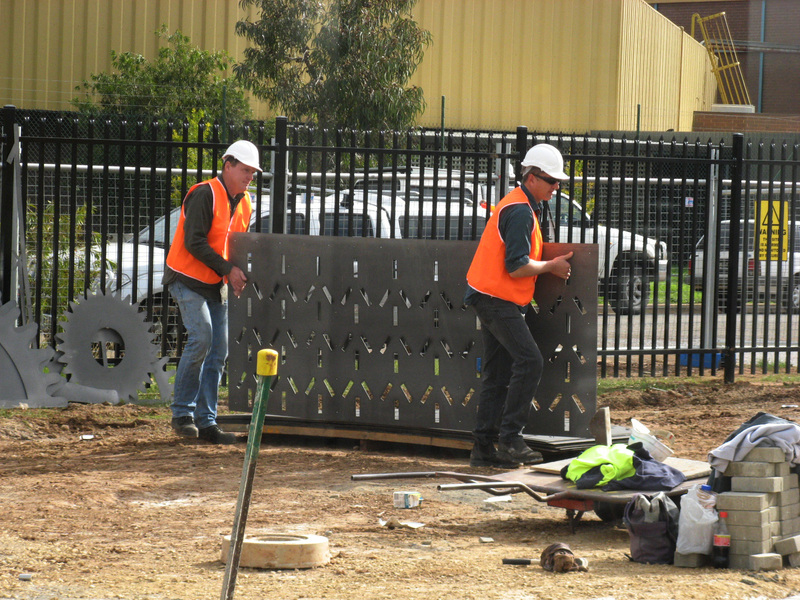 The screen was made in consultation with the College’s Operations Manager, Greg Collins, and Groundplay’s Gregg Mitchell and Greg Healey. 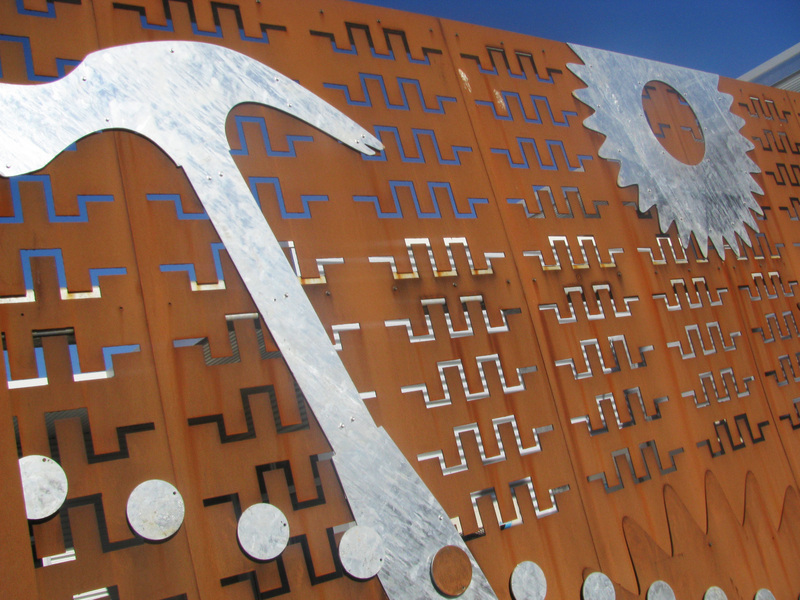 It features laser cut patterns as well as galvanised steel industrial symbols to represent the College’s programs. “That vista had to say ‘vocational experience’ and capture the five original trades. It is an iconic statement,’’ Peter said. 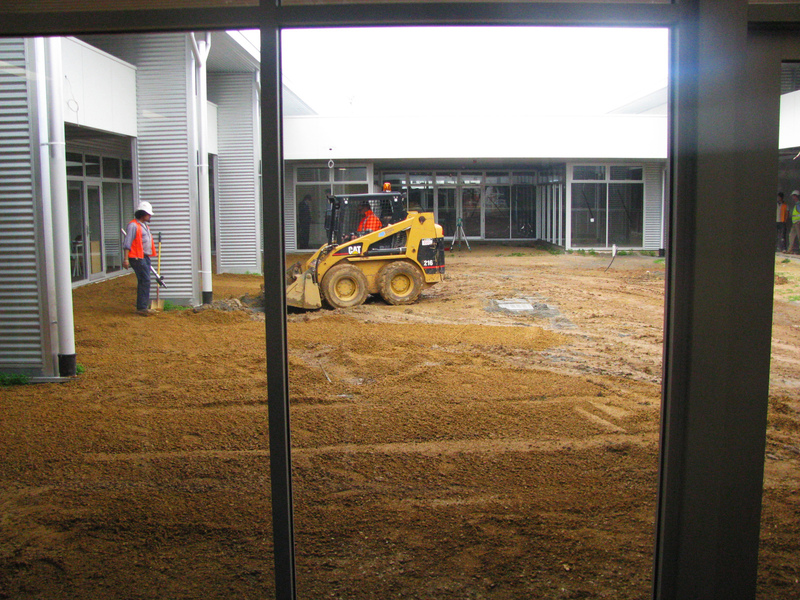 Since completion of the campus in 2007, Peter has returned to the College to design additions and extensions such as the science pods, new learning spaces and a reconfiguration of the library. Peter said he enjoyed building those working relationships with the staff but overwhelmingly the most pride he felt for the project came from seeing the spaces used for their purpose and the success stories which come from the College. “There is a pride there but the pride doesn’t come from ‘it’s a great building’, it comes from what’s happening in that building,’’ Peter said. 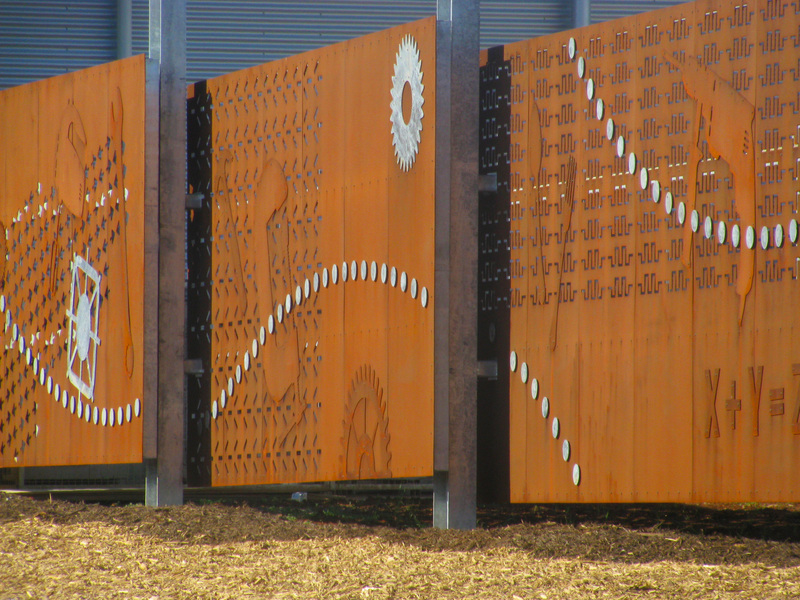 The project, which was done while Peter was at architecture firm Brown Falconer, has received a number of awards including the Architecture Award for Public Architecture, a Commendation for Collaborative Design and the Colorbond Award for Excellence in Steel Architecture from the Australian Institute of Architects SA Chapter in 2009. Peter is a Registered Architect in SA. He is a Fellow of the Australian Institute of Architects and the Past Chair of the Association for Learning Environments SA Chapter Australasia Region. Peter received the inaugural Robert Denyer Cheesman Award for Best Practice in Architecture 2013 from the Architectural Practice Board of SA on 29 January 2014. The award recognises that architecture is for and about people, and that long term relationships based on trust and rapport have immense value. 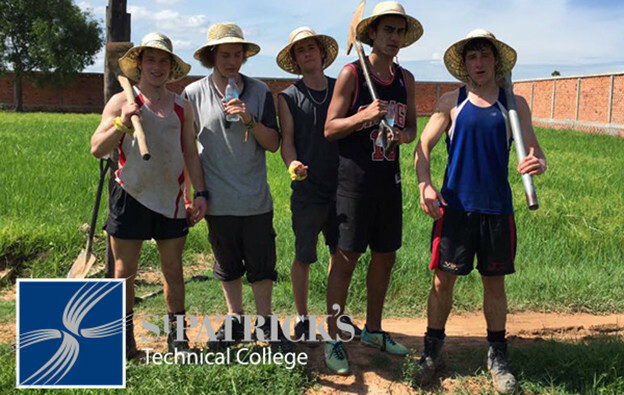 This entry was posted in Latest News on 14/07/2017 by St Patrick's Technical College. 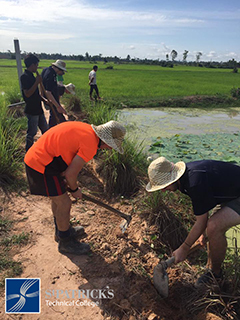 St Patrick’s Technical College students and staff will travel to Cambodia in September 2017 to learn new skills and share their knowledge to help build stronger communities. 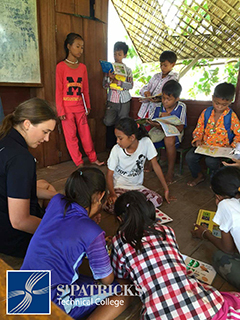 With the help of the Rotary Club of Elizabeth, 14 students and three teachers will spend ten days in Cambodia’s Siem Reap area helping to improve the lives of local school students. Elizabeth Rotary has kindly donated $5000 to financially assist a number of students to take part in the trip. 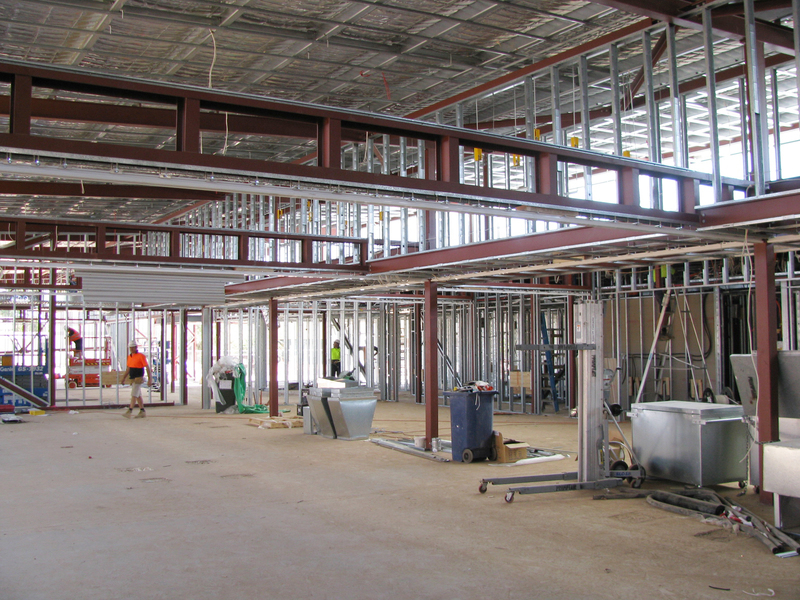 The major project will see students and staff undertake a construction project. 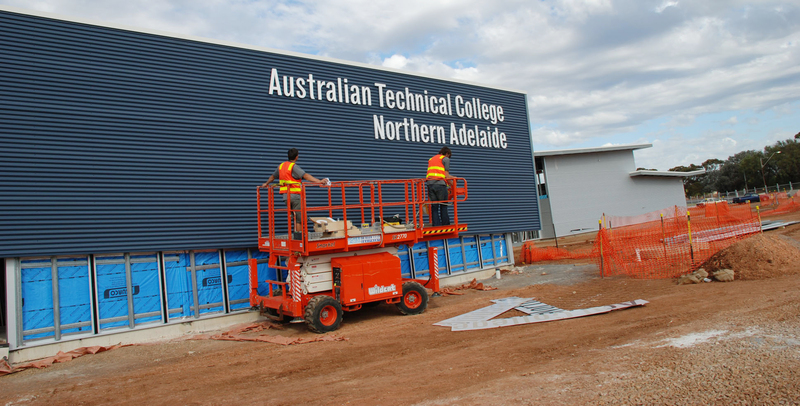 This will use the skills the technical college students have learnt while in the school’s workshops in northern Adelaide and apply them to help a school in Cambodia. 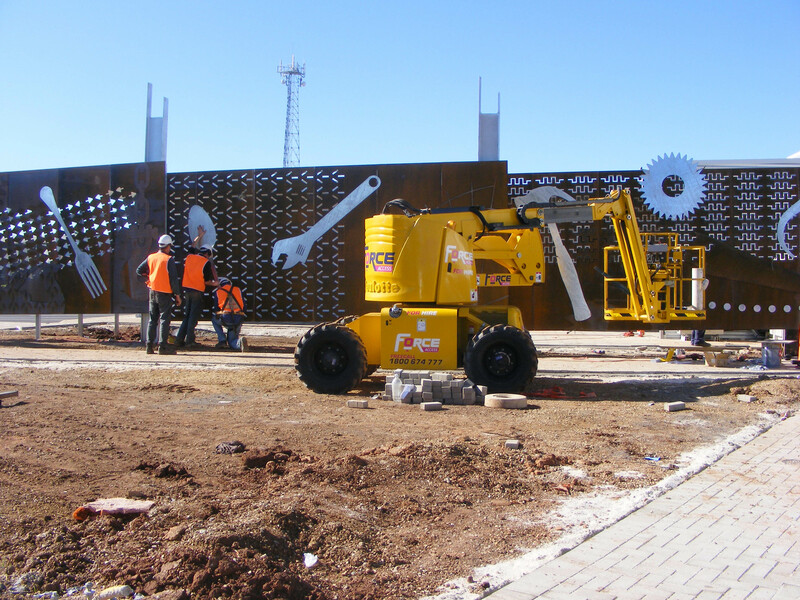 The students will also be asked to teach the local students many of the construction skills to ensure the project can be maintained for the long-term. This year the students will build on the work they did in 2016, which saw 800m of water pipe laid from the local well to the school, by helping to bring water to the community market. The second project will see the school create book packs, buy uniforms and purchase bicycles for students of a remote school. Without these things, students cannot attend the government school. StPatsTech hopes to ease the burden on the local families by buying books, stationery, uniforms and bicycles so remote students can more easily access school each day. The College has launched a GoFundMe page which will raise money that will go directly towards construction material and school needs of Cambodian children. StPatsTech will purchase the goods in-country to reduce shipping costs and support the local economy and encourage those who are able to donate via the GoFundMe page. The journey to Cambodia embodies the St Patrick’s Technical College belief of Faith in Action. Passing on and sharing skills to ensure projects are successful for a lifetime, is an important part of this work by StPatsTech. This entry was posted in Community Blog, Latest News on 11/07/2017 by St Patrick's Technical College. Undertaking work experience is the difference between securing an apprenticeship or not. The extensive work experience program at StPatsTech is one of the main reasons why the College has seen nearly 800 students gain apprenticeships over the past 10 years. 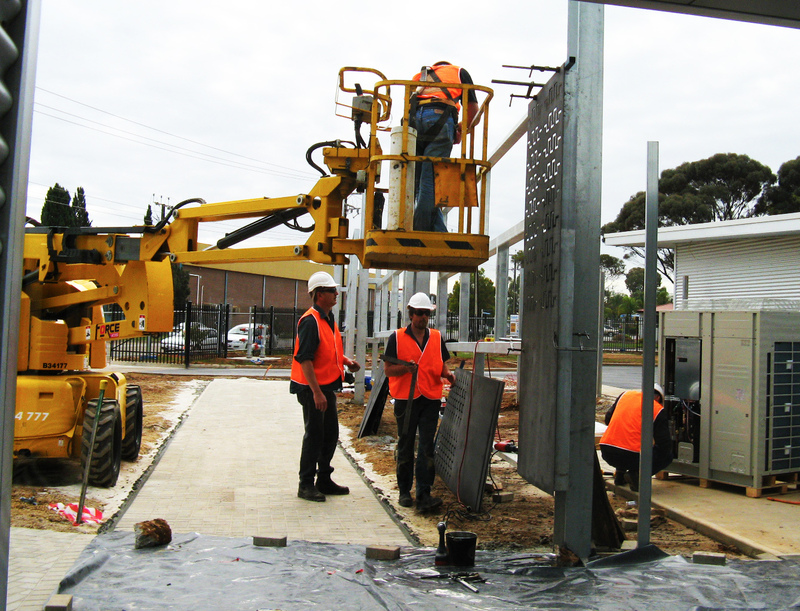 Whether it is a school-based apprenticeship started in Year 12 or a full-time apprenticeship following graduation, employers are consistently sourcing their newest tradesmen and women from the College’s work experience program. For students, work experience can not only rule in potential career pathways, but importantly help you rule out jobs. It also helps builds technical skills, get a feel for the workplace and develop your confidence and communication skills. Brandon Hwang, 16, from the StPatsTech Engineering program spent his latest work experience block at the College’s P-TECH partner, Century Engineering at Edinburgh North. 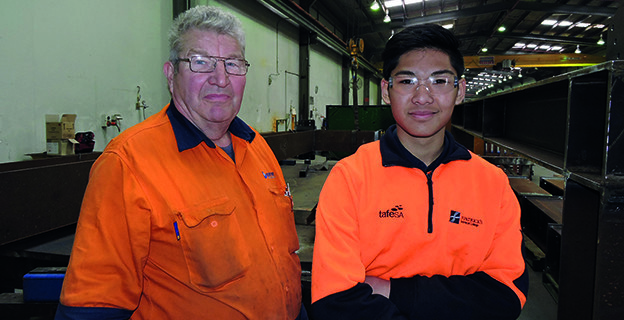 Working with the company’s 71-year-old boilermaker, Ken Tipping, Brandon said he had gained a good insight into the industry he’s keen to join. 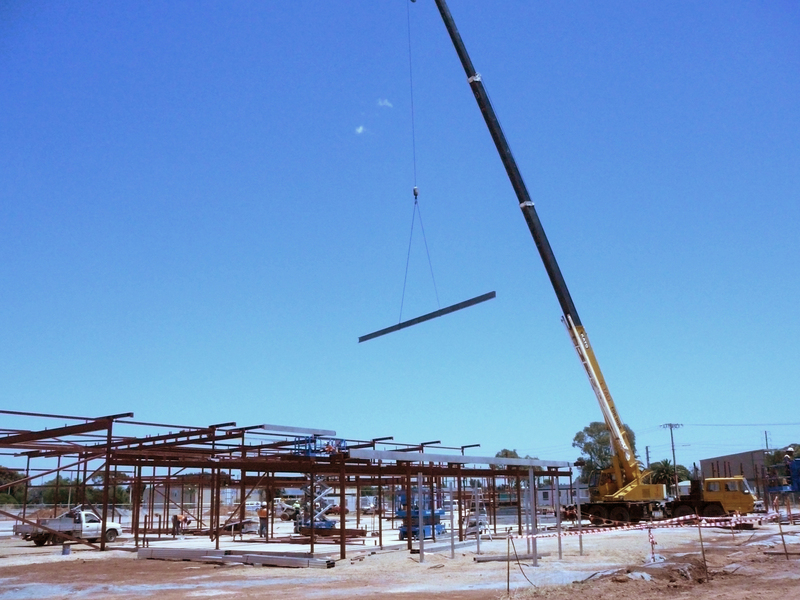 “I’ve been able to see the type of work they do here (at Century Engineering) and how important precisions is,’’ Brandon said. Ken said exposure to industry and workshops was important for potential apprentices to ensure they were on the right career path. “The students need to know if they want to be in this environment because it’s not for everyone,’’ Mr Tipping said. Brandon is one of StPatsTech’s Engineering P-TECH students who, under the guidance of Century Engineering, are learning about the importance of Australian Standards in the welding and fabrication industry. As part of the 2017 P-TECH course, students will learn to do a fillet weld to the Australian Standard by the end of the year. This entry was posted in Industry Office, Latest News on 07/07/2017 by St Patrick's Technical College. Madison ter Bogt, St Patrick’s Technical College Year 12 student and apprentice Chef at FINO Seppeltsfield, has been named as a finalist in the SA Training Awards 2017, School-based Apprentice of the Year Award. Madison said she was very excited to be named as a finalist for the annual prize, which is part of the peak awards for apprentices and trainees in South Australia. St Patrick’s Technical College last year celebrated with Old Scholar, Jack Donaldson, being named as South Australia’s Apprentice of the Year, while Rhys Ferrari, an electronics apprentice with BAE Systems, was a finalist in the School-based category. “This nomination could change my career,’’ 17-year-old Madison said. 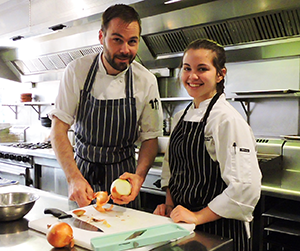 Madison is studying a Certificate III in Commercial Cookery with TAFE SA and under the guidance of head chef, Sam Smith, at the award-winning FINO Seppeltsfield. “Madison is very committed to the industry in her care and attention she pays to products and technique,’’ Chef Smith said. FINO Seppeltsfield has three apprentices in its kitchen at the moment, with Madison the only school-based apprentice. Past FINO apprentices, including, Sarah Voigt (StPatsTech 2011), have gone on to work overseas and in top, Michelin-rated restaurants. Madison has big plans for her future as well. She hopes to travel the world to expand her culinary knowledge. College Business Development Manager, Patrick Kelly, said the school was immensely proud of Madison’s shortlisting in the awards. “Maddie is a fine example of the great outcomes possible for students when educators and industry work together,’’ Mr Kelly said. “Madison is able to focus on her passion for cooking without sacrificing her education and being shortlisted as finalist will open even more doors to her. The winner will be named at the SA Training Awards 2017 Gala Dinner on 1 September at the Adelaide Entertainment Centre. This entry was posted in Industry Office, Latest News on 03/07/2017 by St Patrick's Technical College.